Quiccs is back at it again! 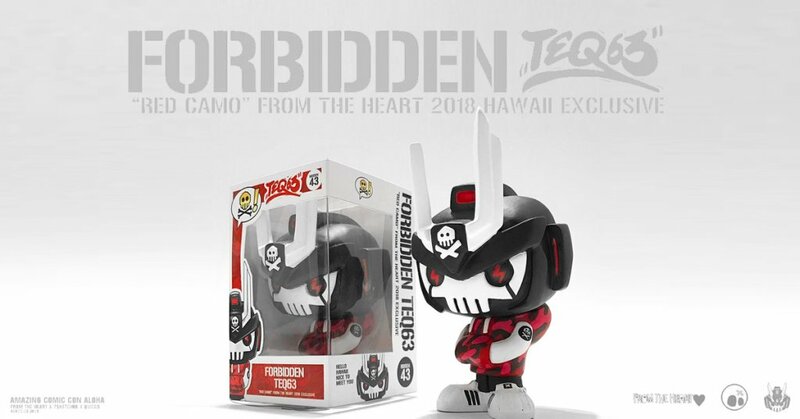 We predict more riots from Funko and Quiccs fans when his “Forbidden TEQ63” Red Camo Edition The Heart Hawaii Exclusive for Amazing Comic Con Aloha 2018. Takes us back down memory lane when Quiccs first teased and release the OG Forbidden TEQ63 back in 2016/2017 it was all out madness. You guys literally begged Quiccs to make a few more of his notorious Forbidden TEQ63 when you first saw them HERE. You guys will have the chance of owning these FUNKO styled beauties. Yeah, we know your dirty little secret, being secret Funko collectors. Anyway, good news for collectors who are heading to Amazing Comic Con Aloha 2018. We’re bringing back the Forbidden TEQ63’s through the new “Red Camo” From the Heart Exclusive Edition They will only be available at the event! We have more surprise releases and a ton of collaborations I’ve prepared with my friend @7sketches to reveal these next few days! 4″-Inch Handpainted resin toy Forbidden TEQ63 Red Camo Edition The Heart Hawaii Exclusive by Quiccs will be at AMAZING COMIC CON ALOHA. No news on the run size or cost, stay tuned for further updates. Thank you for the write up! This is “7Sketches”, one of the two sponsoring Quiccs and artist collabing with him on prints. Tiny correction – the main sponsor is “From the Heart”, not “The Heart”. I know, confusing when you see the store’s name in a sentence, haha.